Butler’s pantries may seem like a nod to a different day and age, but they are seeing a big surge in popularity in recent years. Standard pantries are primarily about function. You can dress them up by using glass jars for bulk goods or corralling like items in baskets, but the typical pantry has a door you can close for good reason! Enter the butler pantry. Think of this as the perfect blend of form and function. A stunningly designed space in which you can store food, keep less frequently used servingware, and mix a cocktail for your dinner guests. The best part? They don’t take up that much more space than a typical walk in pantry. Let’s take a look at some butler’s pantries from real life homes and identify a few key elements for designing your perfect blend of style and functionality. One of the first things you’ll notice when looking at butler’s pantries is a playful use of color and pattern. A small, less frequently used space is the perfect opportunity to try out a bold wallpaper, brightly painted cabinets, or a painted ceiling. Image via Jewett Farms & Co.
You probably won’t be washing a lot of dishes in your pantry, but a small sink will make your pantry especially functional. It creates a natural place for guests to grab a glass of water or prepare a cocktail without being underfoot in the kitchen. 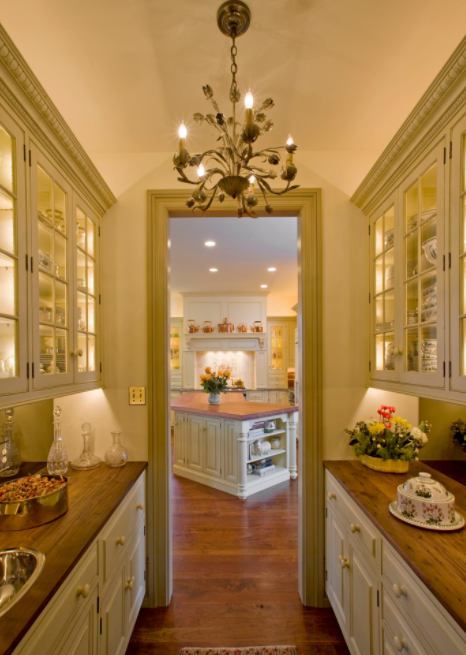 Image via Worthington & Shagen Custom Builder Inc.
Just because pantries are small doesn’t mean you can’t take the drama up a notch or two with a spectacular light fixture. Adding additional light under cabinets or behind glass doors is a nice touch too. Do you have an impressive wine collection or a set of china you only get to pull out during holidays? 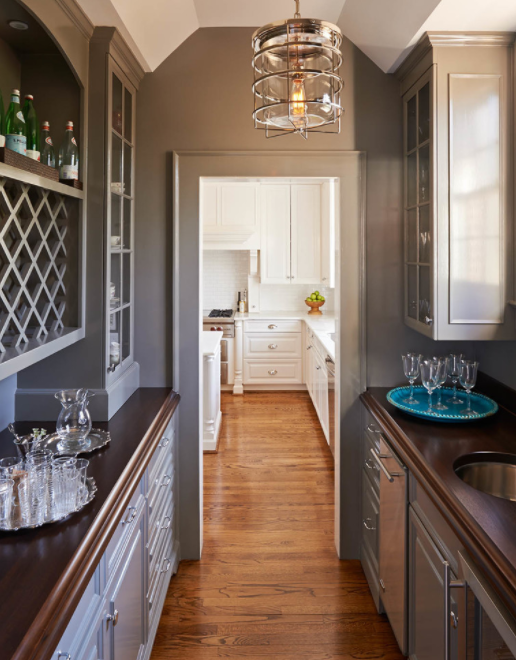 Custom cabinetry in a pantry can be the perfect way to display special items or keep beverages accessible without taking up precious kitchen space. Ready to Add a Butler’s Pantry to Your DC Area Home? 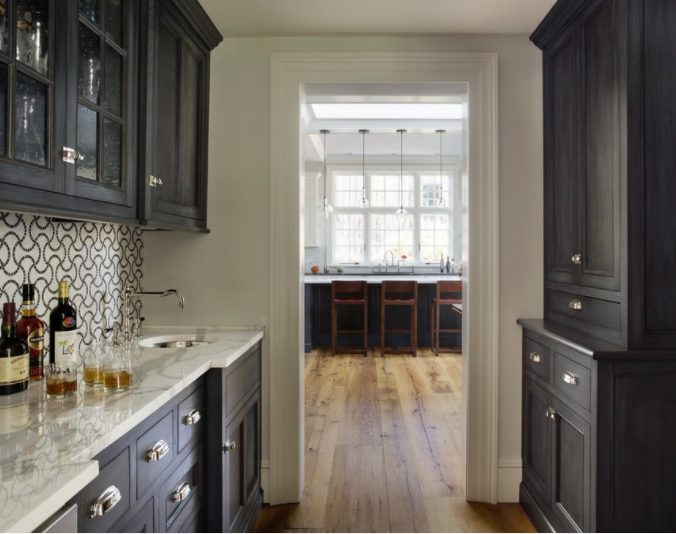 With extensive knowledge and experience remodeling homes and building custom cabinetry in the DC Metropolitan area we are here to help your home look and function at its best. Contact us today to get your estimate. Looking for more examples from real homes? 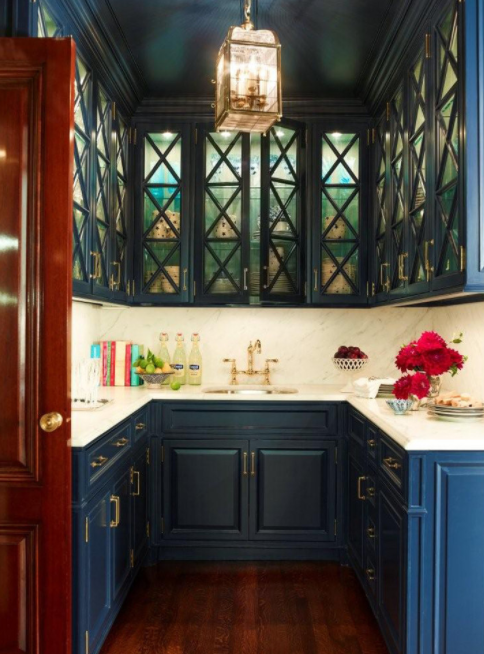 Here are 13 more inspiring butler’s pantries.